The cry reverberated inside police headquarters in Bronzeville on Thursday during a meeting of the Chicago Police Board. Activists with the Black Lives Matter movement turned out to demand justice for Rekia Boyd, the 22-year-old woman shot and killed by off-duty officer Dante Servin in 2012. Servin was criminally charged, but his case was thrown out due to a legal technicality, an outcome some critics blamed on Alvarez’s office. About 40 members of Black Youth Project 100, Assata’s Daughters, and other affiliated groups, each of which had campaigned to oust incumbent Cook County state’s attorney Anita Alvarez, donned bright yellow shirts that read fire dante Servin. At the meeting’s outset, police board president Lori Lightfoot said Servin’s public hearing would take place May 19. Demonstrators met the announcement with jeers. Former police superintendent Garry McCarthy recommended that Servin be fired nearly four months ago. Still, the police board has not heard the case. In anticipation of the four-year anniversary of Boyd’s death this Monday, BYP100 hopes the #SayHerName campaign, aimed at shedding light on black women and girls who are victims of police violence, catches fire as quickly as #ByeAnita, the social media campaign critical of Alvarez that took root in the run-up to the primary. The first speaker during the meeting’s public comment section was Dorothy Holmes, the mother of Ronald Johnson III, who was fatally shot by Chicago police officer George Hernandez in October 2014 during a foot pursuit. Dash-cam footage released last December shows Johnson running away from police before he was shot and killed. Shortly after the video’s release, Alvarez declined to file charges against Hernandez because Johnson was carrying a gun when he was shot. Both Alvarez and Johnson’s lawyer blamed the slow process on the Independent Police Review Authority. The sentiment was echoed by activists who took the microphone. Among their demands: an elected police board, the redirection of funds from the police department to schools and clinics, and Servin’s dismissal. Community members not affiliated with BYP 100 attempted to walk to the podium and speak but were drowned out by the activists’ chants. At one point, a woman defended another person’s right to speak, which resulted in a tense verbal exchange between the activists and other attendees. It was the second time in the past month that an action by black youth activists in Chicago led to the interruption of a public meeting on police matters. Demonstrators previously disrupted a Police Accountability Task Force meeting. Outside police headquarters, the activists joined hands in solidarity. Among those in attendance were people whose loved ones were harmed by a police force that, demonstrators say, doesn’t care about the loss of black life. Martinez Sutton, Boyd’s brother, has become a fixture at these meetings and protests. A man who identified himself as representative of Bettie Jones, who was shot and killed the day after Christmas in what police admitted was an “accident,” said officers had no respect for her life. Shapearl Wells, the mother of Courtney Copeland, who was killed this month but whose shooter remains unknown, said police had not done enough to find his killer. This report was published in collaboration with the Chicago Reader. Just minutes before the Chicago Police Department released a video Tuesday of a white police officer shooting a black teenager to death, several groups of black activists marched to Cook County state’s attorney Anita Alvarez’s office on the near west side of Chicago to attend a community forum. She had waited too long to charge officer Jason Van Dyke for the murder of 17-year-old Laquan McDonald, they said. It was more than a year after the October 2014 shooting and the charges came only after a judge had ordered the release of the video showing his death. This desire to protect not just black lives but “black space” is a tactic that has been embraced by activists and explored by writers in recent months, starting with the highly publicized incident at the University of Missouri when a young journalist was barred from an activist camp on the campus quad, and later at Loyola University, when students stood in solidarity with Mizzou organizers by barring media from a public event on the Chicago campus. Claims to “black-only” space are as much a defense as they are an action, activists say—a defense from manipulative messages, as well as a proactive strategy to reclaim the protest narrative. A distrust of media, political figures, and public opinion has grown in the absence of meaningful reform. In the weeks leading up to—and the days following—the release of the Laquan McDonald video, young black activists from groups including FLY, Black Youth Project 100, Assata’s Daughters, Say Her Name, and Black Lives Matter had intentionally stepped away from establishment figures. Organizers declined an invitation from Mayor Rahm Emanuel on Monday to discuss the video’s release. They called for a media blackout of the “black-only” march on the night the video was released. “Black people please meet at Roosevelt st and Halsted Ave at 5:30pm. 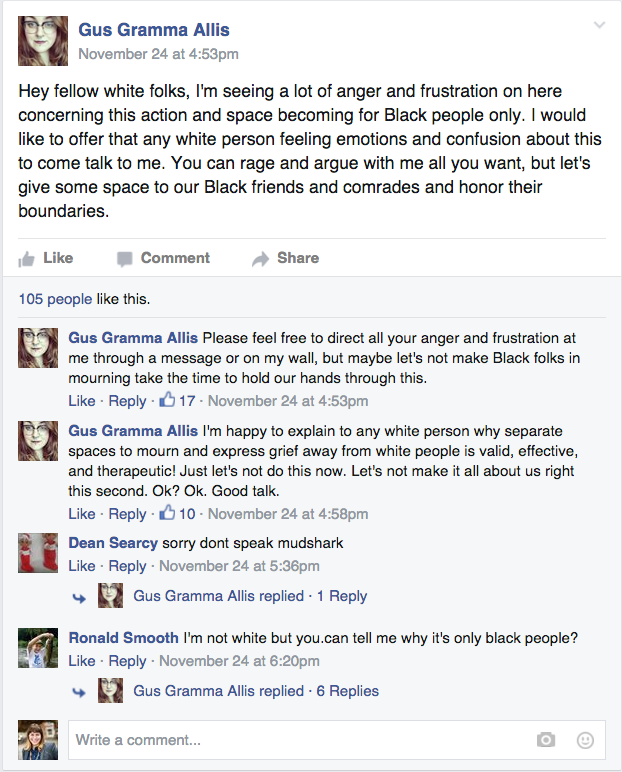 This is a space for Black rage for Black people,” a BYP100 Facebook event page read. For some, the request for “safe spaces” seemed as foreign as it did unnecessary. Why advocate for the racial segregation that blacks had spent so long fighting? Why hold allies of all other colors at bay? “We need to figure out how black people can get space, understanding that space is also time. Black people, especially poor black people, do not have space to heal from [trauma] or even combat [police violence]. Time is a luxury,” LaCreisha Birts, an organizer with BYP100, said in an interview. The rejection of establishment politicians, media, and nonblack people served two main purposes, according to interviews with members of several activist groups: To create black-only spaces that would make it easier to grieve the loss of black lives and to retake the narrative of the “black man or woman shot by white officer” story, which they said had been hijacked to create a spectacle worthy of mass consumption. Activists were fed up with media accounts that they said had twisted their message in order to inflate page views, without giving voice to their demands, including calls for Mayor Emanuel, police superintendent Garry McCarthy and Alvarez to resign, and for Chicago as a whole to invest in the economic and educational opportunities of disenfranchised communities of color. “People have the right to be angry. People have the right to protest. People have the right to free speech, but they do not have the right to commit criminal acts,” McCarthy told reporters at a press release designed to mitigate any violent response to footage of McDonald’s death. “We are prepared to facilitate people’s First Amendment rights to free speech, but we will be intolerant of criminal behavior here in the city of Chicago,” he said. The underlying assumption, activists said, was that young black people are likely to riot and commit criminal acts. By spreading the pleas for peaceful protest coming from public officials, they said, media was endorsing the idea that violence was impending. But there were no riots. With few exceptions, the peaceful protests were filled with chanting, spoken word, and over the weekend, a rejection of Black Friday consumer culture as it traveled down the Magnificent Mile shopping district and throughout downtown on five consecutive days. But just as public officials and the media fetishized black anger, organizers said, so too did they sensationalize black death, creating an unending loop of violence made normal by round-the-clock coverage. Nowhere was that as blatant as in the highly-criticized-then-deleted tweet from the Daily Beast with a GIF of McDonald dying on video. The @dailybeast made the killing of a 17-year-old kid into an animated gif in case you were wondering how much #BlackLivesMatter in America. #BeforeYouWatch know Black death is not a spectacle. it is a brutal truth. it is not a joke. it is normalized but it should not be normal. Multiple activists said the biggest problem was that reporters only showed up to big protests and demonstrations to cover the mayhem aspect, rather than discuss the causes for which organizers advocate on a regular basis. “Who is interested in covering this in an objective way—and who has an angle they are trying to perpetuate?” Jones asked. Organizers with several Chicago-based activist groups joined hands outside of the Cook County courthouse November 25 for the release of BYP100 member and acclaimed spoken-word poet Malcolm London, who was charged with aggravated battery by police the night before—charges that were later dropped. The marches will no doubt continue but the young organizers may not have to wait long for media and political allies to fall in line. Even now, major news outlets and politicians are calling for some of the same measures groups like BYP100 and Black Lives Matter have pushed in recent months, including a federal investigation of the Chicago Police Department and the firing of McCarthy and Alvarez. If and when those demands for accountability become mainstream, the difference between public space and black space may not seem so far apart after all. This report was published in collaboration with the Chicago Reader. Additional reporting by Ronald Reese, Michael Key, and La Risa Lynch.